The Mid-West Old Tyme Hockey League (MWOTHL) is founded to foster friendships and fair competitive play utilizing the Action! PC Hockey Game. The league features Continuous Ownership, conducts an Annual Free Agent Auction and has a Salary Cap. Founded in the Winter of 2018 by Stray Corrado, with much help from John Niespodzianski & Bill Schindel. TeamSpeak3 is software utilized for VOIP (Voice Over Internet Protocol) for internet voice conferencing. All member of the league are expected to act in the overall best interests of the league. Missing deadlines, bending the rules for your team’s gain, collusion with other GM’s or any other activities not in the best interests of the whole league will be dealt up to and including expulsion from the league. Familiarization and adherence to the League Guide is also expected from all GMs. It is the Commissioners duty to direct the operations of the league to ensure the rules are balanced to allow every team an opportunity to succeed. All league officers will be appointed by the Commissioner and will serve at his digression. Any situations that arise that are not adequately covered by the league Constitution, the Commissioner is charged with implementing the solutions he feels will best address the issues at hand. The Assistant Commissioner is appointed by the Commissioner and serves at the Commissioners discretion. arise that may include the Commissioner. ● Keeping the Constitution updated with all approved changes, additions and deletions. ● Assisting the Commissioner as requested by the Commissioner. The League Statistician & Software Developer is appointed by the Commissioner and serves at the Commissioners discretion. ● A list of responsibilities is still to be determined. The league will be comprised of two Conferences. The Clarence Campbell Conference will host the Patrick & Smythe Divisions. The Prince of Wales Conference will host the Norris & Adams Divisions. Take care when naming your franchise. Franchise names can only be changed when a new GM takes over the team. New GM’s are allowed a one-time opportunity to change the name of their teams at the beginning of their first new season. The Commissioner reserves the right to approve franchise names. General Managers (GMs) control a single franchise. The MWOTHL will utilize the latest version of Action! PC’s Hockey Game, unless that version is unstable or has issues that would impede MWOTHL play. In such case the Commissioner will publish the specific version of the game the MWOTHL will be using. All GMs are required to buy the game and buy EACH season disk the league will utilize. NOTE: The commissioner will attempt to get a league discount, so check first before you buy. The Regular Season will consist of 80 games. Each franchise will be responsible for playing their 40 home games. When Actual NHL season lengths change, MWOTHL will adjust accordingly. Games will be played in weekly segments. See Section 12 for GM responsibilities during the Regular Season. The schedule will alternate year-to-year. in each Conference will be wild card teams. The first round of the playoffs will be the Conference Semi-Finals. The Division Winners will be the home team for games 1-2-5-7. The Wild Card teams will be home team for games 3-4-6. The top seeded Division winner will host the lower seeded Wild Card team, the lower seeded Division winner will host the top seeded Wild Card team. 1-2-5-7. The lower seeded team will be the home team for games 3-4-6. In the Championship series the top seeded team will be the home team for games 1-2-5-7. The lower seeded team will be the home team for games 3-4-6. See section 11 for Player Usage Limitations in the Playoffs. For comparing more than two teams: Points earned in the Head to Head games ÷ GP in Head to Head. This allows for the likelihood of having not played head-to-head and an equal number of games. If this is to determine seeding, then a Commissioner monitored coin flip will be the final tiebreaking step. The MWOTHL will play games in one-week blocks. Each GM will have the opportunity to submit a new COA file before the start of each week’s games. This will often be necessary to adjust for trades or player use limitations. It is each GM’s responsibility to make sure your COA files are accurate and submitted on time. It is also each GM’s responsibility update their game with the weeks new game file. Each GM is responsible for playing their home games for the week and submitting their .wks file by the week’s published deadline. Head-to-head playing of games utilizing the built feature of Action! PC Hockey during the regular season is encouraged but not required. The MWOTHL encourages using Head-to-Head play for Play-off games, but it is not mandatory. This allows each GM to make last minute changes to their line-ups and strategies. When not playing head to head the visiting coach will be responsible for submitting a COA file. Play-off games should not be played out of sequence as player limitations might have a major impact on line-ups and tactics. Active players are players who are rated in the current Action! PC hockey game and under contract to a MWOTHL Franchise. Restricted Free Agents are players on the current Action PC Hockey game season disk who appeared in fewer than 10 NHL games for the season in use AND they are not already under the control of any MWOTHL Franchise. These players may not be drafted and will NOT appear on the MWOTHL player disk for the current season. If a player of this type shows up on the season disk, contact the commissioner and he will be removed to avoid any confusions. Unrestricted Free Agents are players who are rated in the current Action! PC hockey game and who are NOT currently controlled by any MWOTHL Franchise and who are not classified as Restricted Free Agents. New players rated for the 1st time by Action! PC Hockey will be UFAs. Unrestricted Free Agents will be available to any MWOTHL Franchise in the Annual Free Agent Draft. 5.4.2.2. Roster Cut Down – A player kept in the NC status needs to be part of the 15 player keepers at Roster Cut Down. 5.4.2.4. Trading – A player in the NC status may be traded subject to MWOTHL trading requirements. His CY and CV will continue with the new team and the new team must have room for his NC status (i.e. no other NC players currently on his roster at the time of the trade). Any player who has played at least 1 game in MWOTHL and is no longer rated by Action! PC Hockey and is retired from the NHL considered Retired. Only Retired players who have been voted into the MWOTHL Hall of Fame. The Rookie classification is used only for MWOTHL AWARDS. MWOTHL rookies will be players who have played less than 26 MWOTHL games (cumulative) in any preceding MWOTHL seasons. The player must be less than 26 years old on September 15th of the MWOTHL current season. Each MWOTHL Franchise will a 30-player roster. Requirements for this roster are noted below. MWOTHL Active rosters will be set at 30 Action! PC Hockey rated players. One player in an NC status is allowed within this 30-Player limit. It is each GM’s responsibility to ensure that his 30-man roster has enough games to cover all his positions for a full 80 game schedule. See Goalie Drafting restrictions in section 8.5. Each week, each MWOTHL team is required to set an active Playing roster of 18 skaters and 2 goalies (20 players total). The playing roster will consist of 12 forwards, 6 defensemen, and 2 goalies. The MWOTHL rosters will be controlled by roster size (30 players) and contract value limits. All players will have a Contract Value (CV) based on Contract Years (CY). Contract Values will adjust annually based on playing time on rosters. The term Contract Years refers to how many years a player has been on a MWOTHL team. CY is used to determine the players’ Contract CV (see section 7.2). All players begin with a CY of 1 when they are FIRST drafted. As a player continues in the MWOTHL and remains on an active roster, each year his CY will increase by 1. There are two limiting factors to Contract Years – maximum limit, and release readjustment. If a player is traded while under contract his CURRENT CY value remains with him when he goes to the new team. 7.1.1. Maximum limit and length of contract. The maximum limit for CY in MWOTHL is 7. After a player reaches 7, he is automatically released after that current MWOTHL season and returned to the UFA draft pool (provided he appears on the next season disk and played in 10 or more games in that season). This value of 7 for CY is total years for that player, even if he’s been traded. It is the total accumulation of consecutive years of a contract with one or more teams. 7.1.2. Contract Year [CY] length adjustments. 7.1.2.1. If a player completes his 7th consecutive year under contract and is released to the player pool as a UFA, his CY entering the next draft reverts to 4 and his Contract Value [CV] is based on that CY. 7.1.2.2. If a player is released by a team at the roster cut-down point to the player pool as a UFA, his CY is reduced by 2 (minimum CY will always be 1). Values are based on the CY at the time of release. Example: Team A has a player on roster with a CY of 5. He is released at the end of the season to the pool and is still eligible for drafting in the upcoming draft. His CY will be reduced to 3. And this CY of three will be used to determine his Contract Value [CV]. NOTE: A player dropped in this manner MAY NOT be redrafted by the releasing team until the 2nd Round of the next player draft. This protects against teams dropping players with the sole intent of resigning at a lower CV – but if no one wants the player in the 1st round, the releasing team is then eligible to redraft him if available with any pick the team may own in round 2. 7.1.2.3. player who has been released to the draft pool, either a UFA, RFA, but is NOT DRAFTED during the upcoming season’s draft, will have his CY reduced to 1 the next year he is eligible to be drafted and is drafted. This will also be the case for a player who is released, and he was not on the disk in the upcoming season. If a player is not on a disk for a season and not on a roster as an NC player, his CY will be back at 1 in the next season he is eligible. Contract Values are capped per team and there are two points in the season were the cap is implemented. At the draft teams will have a set CV based on whether they made the playoffs in the season just completed. Then after the draft – and during the in-season period of play up until game 60 in the season, all teams will have expanded CV cap to facilitate trading. However, GMs must consider the RCD cap when acquiring new players, it might be a one and done thing if they can’t afford to keep them. Year 1 all players have a CY of 1, so their CV is 1 and each team will have 30 players. So, 30 works for 1st year. 2nd year (see Table in Section 7.2.3) players will have a CV of 2, and since all teams will be keeping 15 and dropping 15, their CV for year 2 from RCD through the draft will be 45. Note: (and this is discussed in further detail in Section 9.2) teams will always be cutting 15 players each year and drafting (or trading for) 15 new players. Therefore, at RCD each team, at a minimum, will need to have a team CV that is at least 15 below the RCD total. 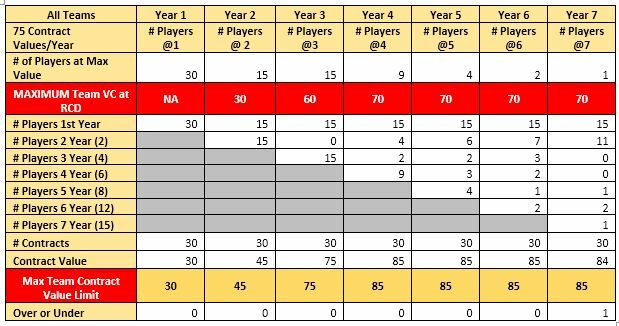 Example: Each team in year 3 after cutting 15 players can have a team CV total no greater than 60 so they can acquire (at a minimum) 15 new players with CV of 1 each. Remember there may be some released players in the draft pool with a CV value greater than 1, so if you are seeking any of them, you RCD CV needs to account for this. Plan your roster cuts carefully. As noted, the contract year for each player retained increases by 1 every year and therefore their contract value increases accordingly. Players released at Roster Cut-Down [RCD] have their CY value reduced as noted in section 7.1.2.2 down to a minimum of 1. Since each team has a cap, it does limit the number of players you may keep over a longer period. This is further discussed in Section 9.2. Each year, at a date established by the commissioner, the MWOTHL will conduct a 15-round draft to rebuild the team rosters. Except for year 1, the draft will consist of a LIVE DRAFT using a live web tool such as SLACK CHAT for 5 rounds, followed by daily internet draft using a draft tool developed for the MWOTHL. Below are the procedures for the INITIAL MWOTHL draft and the subsequent seasons Annual Draft. Initial draft will consist of 6 live rounds conducted via SLACK CHAT and 24 rounds via an interactive internet tool developed for MWOTHL. Time frames for the 24 rounds will be released by the commissioner as the draft approaches. The initial draft will be conducted in a Serpentine fashion. 1st team to pick in round 1 will pick last in round 2. The Commissioner will use a Random Generator to seed the draft pick order for the initial draft. Once the Initial Draft is over, official MWOTHL Trading can commence – see Section 9.2 for trading rules. Each year the MWOTHL will conduct an annual draft to restock each team’s roster. The draft will occur at a time determined by the commissioner and after the annual Roster Cut-Down date. The Annual draft will be determined by the previous season’s standings and by a Lottery. The basic draft order will be the inverse order of the previous year’s standing except for round 1. Round 1 will use a Lottery System to determine the order of the non-playoff teams from the previous year. The Lottery will only impact the weakest teams from the previous season. For all subsequent rounds the order of the draft will have the weakest 8 teams drafting 1 through 8 and the picks 9 through 16 will be as in round 1. Regular Season Goal Differential: (Team Goals Scored – Team Goals Allowed) – team with the lowest number gets the earlier draft position. If there is still a tie and this is to determine draft order position, then a Commissioner monitored coin flip will be the final tiebreaking step. The Annual Player Draft will end when all MWOTHL Franchises have reached maximum roster size of (30). Goalies in MWOTHL have game for game player usage, and there are often limited numbers of goalies available. Therefore, there are a few extra parameters to consider when drafting goalies. Remember that each team can have 2 or 3 goalies and that the minimum actual games played for the team’s goalies need to be between 85 and 100*. A. INITIAL DRAFT – only 1 goalie with actual games played of 40 or more may be drafted in the first 25 rounds. B. ANNUAL DRAFTS – if a team has 1 goalie on their roster with 40 or more actual games played for the upcoming season, no goalie with 40 or more actual games can be drafted during the 5 LIVE draft rounds. C. ANNUAL DRAFTS – if a team has 0 goalies on their roster with 40 or more actual games played for the upcoming season, they can draft 1 goalie with 40 or more games played during the 5 LIVE draft rounds. D. ANNUAL DRAFTS – Rounds 6-15. Any team may draft any available goalie with the only restriction being TOTAL ACTUAL GOALIE games is limited to 100 games played. Slight variance (10-15% max) will be granted, but this is not an excuse to abuse. If you end up with 2 or 3 goalies (or any amount) that exceeds 115, you will be required to drop the last goalie acquired and replace him on your roster. This may occur at the end of the daily session where it is discovered or at the end of the draft. And if dropping this goalie puts you below the minimum # of games played by goalies, you will be required to replace the dropped goalie with another goalie. GM attendance is expected at the Annual Player Draft. If a GM is unable to attend the Annual Player Draft, it will be his and only his responsibility to submit a priority list of players he wants to draft. Since this is a very complex decision-making process the Commissioner and the League will not be responsible to make changes to the submitted list. Another alternative would be for the missing GM to appoint another GM to make his picks. If you wish to assign another GM as your Proxy, you must notify the Commissioner by E-Mail at least 24 hours prior to the start of the Draft. The Roster Cut-Down is one of the most important elements each year in building your franchise. The RCD occurs after the playoffs. The RCD is also designed to foster team building turnover that ensures opportunities for each franchise to develop winning teams. It also allows for coveting your favorite player – but at a cost – as well as allowing for multiple opportunities for a star player to be owned by more than one player over the course of his career in MWOTHL. Each team will be required to cut exactly 15 players from his roster after the season at time designated by the Commissioner. Any player may be cut, including players on your roster who are in an NC status (as they count against your 30-man total requirement). 1. Release him (cut him) – he goes off your roster and is not eligible in the upcoming draft. His draft eligibility returns when he next appears on the disk (at which time he will have a CY of 1 when/if drafted). 2. Keep him again as NC player. His CY will increase by 1 and his contract value will increase accordingly making him more expensive to keep. B. Player on current roster who was active in the just completed season but not on disk for the next season – if you have a player on your end-of-season roster who DID NOT play in the upcoming season AND you want to KEEP him, he will have to be retained at the RCD in order to keep him, and he becomes an NC player (limit 1 per team). His CY increases and his CV increases accordingly. If he is cut, and is NOT on the upcoming season disk, he will not be eligible for the draft. At the end of each season, all players on rosters will have their CY increased by 1 and their contract value increased according to the Contract Value Chart (Section 7.2.3). This determines the new CONTRACT VALUE for your roster. You need to use this new total contract value as you decide who to cut and who to keep. As you will be drafting 15 new players and retaining 15 existing players, these values go hand in hand. Each team has a set TOTAL CONTRACT VALUE going into the draft. This value is determined by the MWOTHL season year (1, 2, 3, 4-and beyond) and is the same for all teams whether or not they were in the playoffs. Since a team will be drafting 15 NEW PLAYERS each year, as a minimum your team’s combined Contract Value at the end of RCD needs to be at least 15 less than the total CONTRACT VALUE allowed for your team. HOWEVER, if you plan to try and draft any players who were released by other teams, you need to consider how much more you might need in order to draft them since their CV in the draft may be greater than 1. And because there are total CONTRACT VALUE limits, it also affects who you can keep and for how long. The following chart shows a possible combination of players who can be retained by value. Of course, there are variations – especially in how you draft MWOTHL veterans in the draft pool. But remember the basic requirements: We cut our roster in half EACH YEAR, and we draft 15 NEW players EACH YEAR. The below chart is a sample. In league files provided every team, there will be an interactive version of these tables for your use in determining who you can retain or need to cut at cut-down point. The important thing to remember is what you ROSTER VALUE needs to be (at minimum at RCD time). The Commissioner will provide annual directions on the process to follow for Roster Cut-Downs. And at or about the same time, the Commissioner will provide the next year’s season disk and scouting files. Player Transactions include Trades, and Injury Call Ups. MWOTHL Trades are the transfer of contracted players (Active Roster) and the next season Draft Choices between two Franchises. Trades CANNOT be made for “Future Considerations”, “Players to be Named Later” or for draft picks beyond the next upcoming season. Pre-season from the completion of the Annual RCD through the Annual Draft. In-Season trading – which starts at the completion of the Annual Draft and continues until game 60 of the Regular Season. The commencement of this will start shortly after the Annual Draft when the commissioner has finished compiling the draft results and announces the opening of in-season trading. Pre-Season trading is open from a date set by the Commissioner or his designee, after the end of the previous season’s championship game, and after the new season’s Contract Year and Contract Value increases have been assigned and the Annual Roster Cut-Downs are completed. Pre-Season Trades ARE constrained by Team Total Contract Value limits in place prior to the Annual Draft. Trades can involve picks for players and picks for picks. However, the only provision is that after a trade, each team will retain the ability to finish the Annual draft with 30 players. You can trade player for player, or player for pick, or players for players and picks but the final combination must keep each team on the 30-player goal AND within the total CV at the end of the draft. EXAMPLE: Team A could be at Total Contract Value 55 with 15 players 15 picks available and trade one of their picks for a player with a CV of 6 or less and still be able to draft 14 new players each with a CV of 1. The team that traded the player has reduced their TEAM TOTAL CONTRACT Value by 6 and now has 16 picks in the upcoming draft. After the Annual Draft and Rosters are confirmed, In-Season Trading Opens and continues until the Trade Deadline at Game 60. After the Annual Draft the Total Contract Value Cap increases for in-season trade purposes (Chart is in Section 7.2.2. In-Season trades may involve players and the next season draft picks, but the players involved must be on a 1 for 1 basis and the traded picks must be on a one for one basis. Teams receiving players must ensure the CV values of the players involved in the trades keep the teams within the in-season CV cap ($51 for year 2 and $85 for year 3 and beyond). All Trades must be approved by both GM’s by e-mail to the League Commissioner or his Designee. The Commissioner must review and approve all trades before they are finalized to insure the trade is balanced and will not substantially alter the balance of play in the league. Trades submitted, confirmed and approved by the end of the GAME PLAYING will go into effect for the upcoming week’s games. The Commissioner will move all players involved in trades. Therefore, trade submitted, confirmed AFTER the Game playing cycle will not go into effect until the following week. Take note of this deadline. If the Commissioner is involved in the trade the Assistant Commissioner will make the review. The Commissioner will not approve any trades that appear to be taking advantage of a rules loophole, collusion among General Managers, or that are not in the best interest of the league. Trades that take a team beyond the maximum CV for one of the teams in the trade will not be approved. Any Trade that is not approved may be appealed. The Commissioner will appoint a three-member committee to review the trade. If the Commissioner’s franchise is involved in the appeal, the Assistant Commissioner will appoint the three-member trade review committee. The Trade Review committee will make their decision on the appeal within 48 hours. The MWOTHL does not limit, rather it encourages, coaches to communicate and talk trades. However, no formal agreements can be made and submitted to the League except during the two Open Trading Periods. Generally speaking if teams properly fill out their rosters, the team should be able to complete the season with the 30 players they have. However, it is possible that poor player game management may deplete your roster to the point where you are not able to field a full 20 player Game Day roster. In these cases, you will be able to Call Up a player or players from the existing Free Agent Pool. This will only be a temporary replacement. The player will be coded 6 (Waiver Claim) in the DB on your roster and you will not retain the rights to this player. As soon as the season is over, the Called-Up players will be released back into the Free Agent Pool. 10.1.6.1. You have only 12 or fewer forwards eligible to play. 10.1.6.2. You have only 6 or fewer defensemen eligible to play. 10.1.6.3. You have only 1 goalie or fewer eligible to play. 10.1.6.4. 10.1.6.4. There are no restrictions on who may be called up from the free agent pool for Usage Call-Ups EXCEPT that the player called up needs to fill the position gap that exists. Rosters will only be updated at the beginning of the next scheduling block. It will be the GM’s responsibility to make sure they have submitted an update COA file reflecting the roster changes. Player usage limitations will be factored on the number of NHL games played in the previous NHL season. The MWOTHL will set Injuries to “ON” – game only and Suspensions to “OFF” for Skaters and Goalies. Most Skaters will be limited to 110% of the NHL games played for the Regular Season. Low rated skaters are an exception to the above player limitation chart. Low rated skaters are any skater who has a combined OFF + DEF rating of less than 8.0 and who played in 40 NHL games or more. These Low rated skaters can play up to NHL GP * 1.25 and they can play in all playoff games. These Low Rated Skaters will allow Franchises more roster flexibility but only with players of marginal ability. All goalies will be limited to their actual number of NHL games played for the Regular Season. In the playoffs any goalie who played in 41 games or more can play in all 21 possible Play-off games. Goalies who played in less than 41 NHL games will be allowed to play in 1/3 of their NHL games in the playoffs. As an example if Goalie A played in 24 games in the NHL he would be allowed to play in 8 of the 21 possible Play-off games. See chart displayed in rule 10.5.1. Low rated goalies are an exception to the player Limitation chart. Low rated goalies are any goalie with a Goalie Rating of 5 or less and who played 20 games or more. The low rated goalies can play up to NHL GP * 1.25 and they can play in all playoff games. This will allow Franchises more roster flexibility but only with players of marginal ability. Action! PC Hockey tracks how many consecutive games a goalie plays. Each goalie has a consecutive games played rating. If a goalie plays more than his rated number of consecutive games played, his in-game rating will be decreased. The more games he plays consecutively the more his in-game rating will be decreased. It is the GM’s responsibility to monitor his player’s usage and make sure he adjusts his lineups to comply with the rules in Section 10. Specific penalties will be adjudicated on a case by case basis. The magnitude of the abuse will be one consideration. The quality of the player who exceeds his playing limits will be another consideration. Finally the impact of the abuse may have had on the rest of the league. Penalties can range from a warning to league expulsion for egregious exploitation of the Player Usage Limitation Rules. There are times in a game or a series of games where you will need/want to play a player out of position. When you play a skater out of position his skills will be downgraded by Action! PC HOCKEY. You can play players out of position. Keep in mind playing a forward on defense or a defenseman at forward will be a big downgrade in skill. You often see a forward play one of the point positions on the Power Play. Action! PC Hockey seems to make this a minor defensive skill down grade. On Penalty Kill units playing a forward out of position also is a minor defensive downgrade. The MWOTHL will be using the latest version of Action! PC Hockey unless the Commissioner determines that the current version is unstable, and he identifies a different version for league use. It will be each GM’s responsibility to upgrade to the MWOTHL authorized for the season. Each GM will purchase their game and annual updates for Action! PC Hockey from DKS Sports. The MWOTHL is working with DKS Sports to establish a discount program for league purchases. If you play in multiple Action! PC Hockey Leagues you may purchase your Game/Upgrades from them, but all GM’s are expected to purchase the game and upgrades from DKS Sports. These in-game rules settings will be determined and published before the season starts. The Commissioner will be responsible for creating all these settings and they will be included in the League File. The settings for the Playoffs will be determined and published prior to the start of the playoffs. The Commissioner will be responsible for creating all these settings and they will be included in the League File. It is each GM’s responsibility to set the Action! PC Hockey game files prior to the start of each season. This includes loading any new version of the Action! PC Hockey game authorized by the MWOTHL. It also includes creating sub folders for the MHWL files. First and foremost, it is the GM’s responsibility to meet all league deadlines. Failure to meet deadlines not only affects the league administrators (Commissioner/Statistician/Website Manager) but it also impacts all 15 of the other GM’s. • GM’s will be expected to communicate concerns and issue to the Commissioner in a timely manner. • GM’s are responsible to submit new COA files when their Game Day roster changes. • GM’s are responsible for loading and using the weekly league files. Playing with old League files will impact other GM’s player usage. • GM’s are responsible to monitor their player usage and adjust his line-ups. • GM’s are responsible for attending the Annual Free Agent Draft – the date is set well in advance. Franchises that are abandoned in Mid-season will continue to play games under the direction of the league. The Commissioner will attempt to find a replacement GM. The Commissioner may seek a volunteer to temporarily take over the control of the Franchise until a new GM can be identified. The abandoned franchise games will be simulated with both teams being controlled by the computer. If the MWOTHL has multiple abandoned franchises at the end of the regular season, the Active Rostered players on the abandoned franchise rosters will be combined into a dispersal draft pool and a dispersal Draft will be conducted for the new GM’s/Franchises. The teams will draft a minimum of 15 players from this pool up to a maximum of 30. They will then be required to perform roster cut-downs in accordance with RCD procedures in Section 9 and subject to Total Roster Contract Values. Rated Players who are not selected in the dispersal draft will automatically become Unrestricted Free Agents (UFA) and be eligible to draft in the upcoming Annual Player Draft. Their CY value will be adjusted in the same manner as any player released at RCD (see Section 7.1.2. Over time changes to this League Guide will be required. The MWOTHL Commissioner has the authority to make immediate changes to the League Guide if he feels the changes are necessary and important and for the best interests of the league. Commissioner changes are immediate and do not require GM approval. General Managers may also propose changes to the League Guide. The proposed changes will be voted on by all the active GM’s. GM proposed League Guide changes must be submitted using the League Guide Proposal tab on the League website. (1) A brief overview of the change. A detailed step by step listing of the change citing the specific League Guide sections affected this section of the proposal must be clearly written so that all GM’s will understand the changes requested. A list of the reasons this proposed change will benefit the league. A list of possible issues or concerns this change may pose to the administrators or to the Franchises. 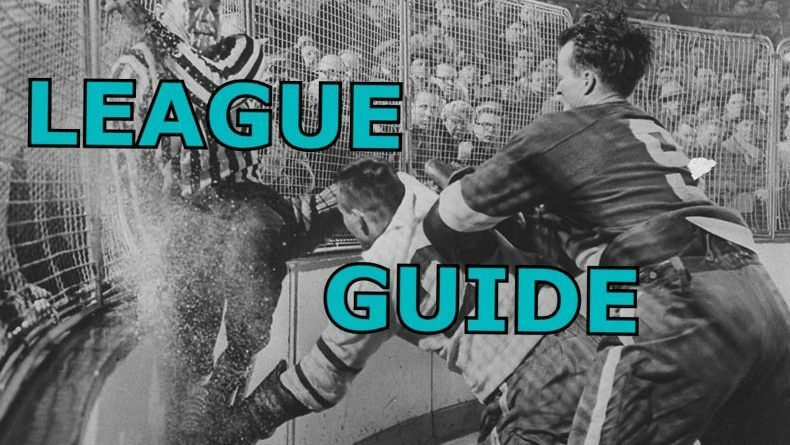 Each League Guide change proposal will be reviewed by the Commissioner and any other designees he appoints. • Adding more work for the Commissioner and/or the Statistician will need to be justified. • The proposed changes need to be balanced and not allow for any franchise to have a unique advantage. • Adding more work for GM’s in-season takes away from playing and enjoying the games. • The league seeks to bring as much reality to the league as possible without adding additional burdens and lowering the ability to have fun. For GM proposed League Guide changes voting approval must have greater than 60% of the active GM’s at the time of the vote. An example: with 20 GM’s active it will require 12 positive votes for approval. After a League Guide change has been voted in, the process to implement the change(s) will be directed by the Commissioner or his designee. They will likely require an implementation plan to identify all the changes required. Some changes may have such major impact they may not be able to be implemented in the current season. They may require a phased in implementation or a delayed implementation.